I love decorating for Christmas and the winter holidays. There’s something about all that sparkle and warmth at the darkest time of the year that just lifts my spirits. I have a lot of traditional red and green decorations with a more natural feel, because our last house was an old Craftsman, and that theme fit it well, but in recent years, I decided to shift towards bright and silver! I set out to do this while reusing as much as possible. 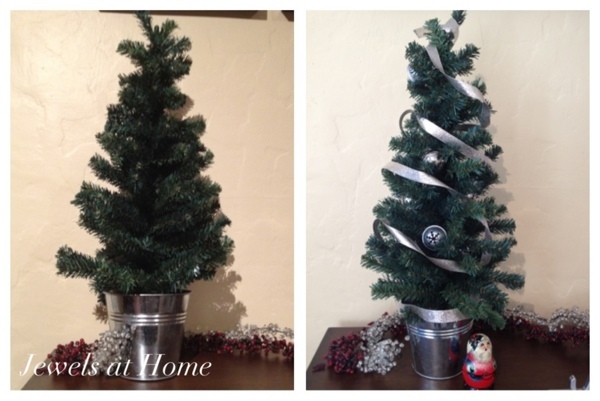 You can see how it turned out in last year’s 2012 Christmas house tour, and in this post, I’ll give details on how to add silver and shine to your holidays without breaking the bank. Silver spray paint. Rustoleum metallic spray paint in “chrome,” and Krylon “bright silver” which I already had. Silver craft paint. I used this to touch up some decorations and ornaments we had and add some sparkle. Silver ribbon – Michael’s had an array of ribbons at 60% off when I was there, and I had some in my craft closet as well. I’ve had these “PEACE” and “JOY stocking holders for many years now. They were a lovely antique bronze finish that got refreshed with a spray primer and a few coats of Rustoleum chrome paint. It has a very bright and reflective finish that looks like real metal. 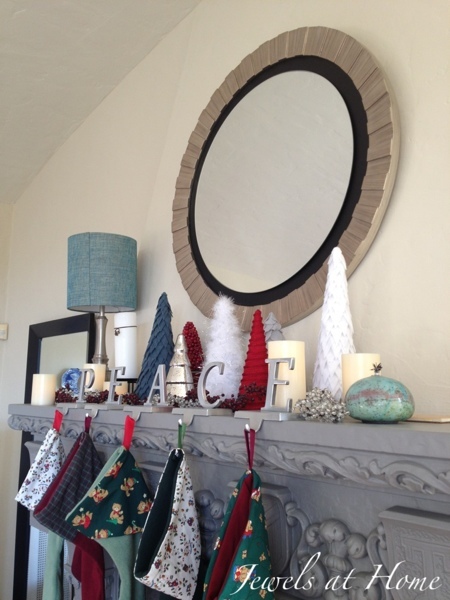 I painted these stocking hangers with metallic paint for a shiny new look. I also painted these mercury glass look-alike ornaments in silver. 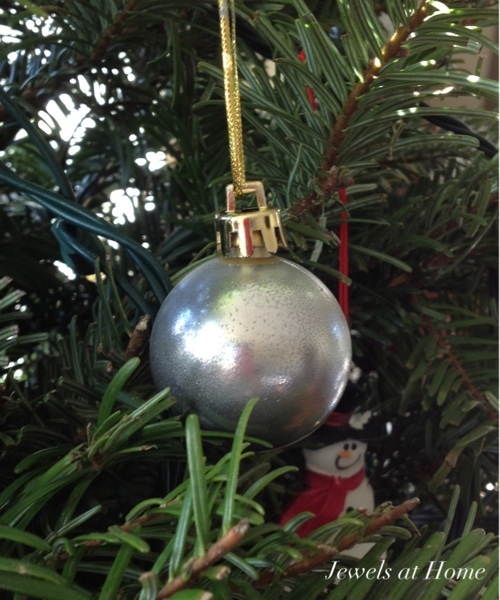 Two easy steps to get a faux mercury glass look on your old ornaments. And finally, I painted some pine cones with the Krylon bright silver paint and used the on their own, as vase filler, and on wreaths. Spray some pinecones in silver paint to brighten up your holiday decor. 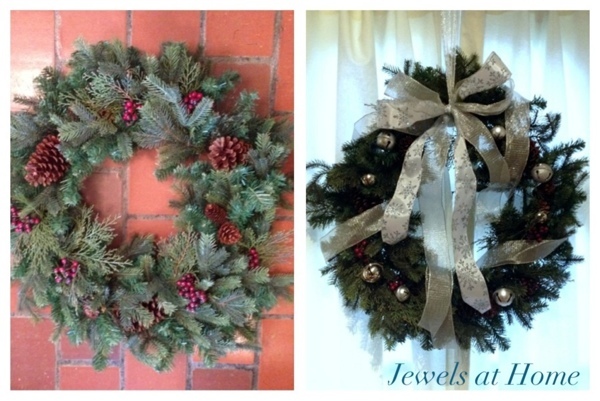 I had three wreaths in traditional greens and reds. 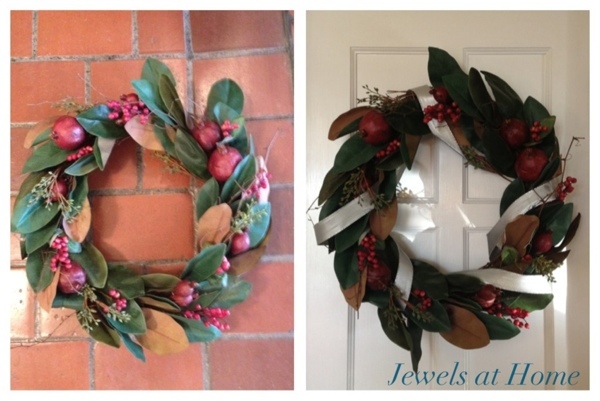 This pomegranate and magnolia wreath from Restoration Hardware got a new look with some simple silver ribbon wound around it and used for hanging. 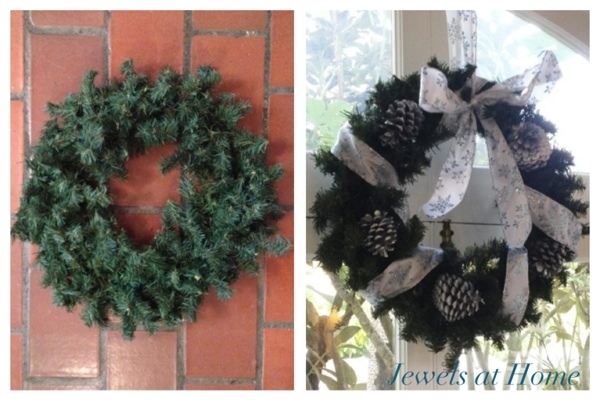 For my oversized wreath with pinecones and berries, some silver bells and ribbon gave a whole new look. My third wreath was this plain wreath that wore a burgundy velvet bow for more than a decade, and now it’s ready for the next decade with new ribbon and pinecones painted in silver. I did splurge (as much as one does at Target) on this silver beauty for our front door. 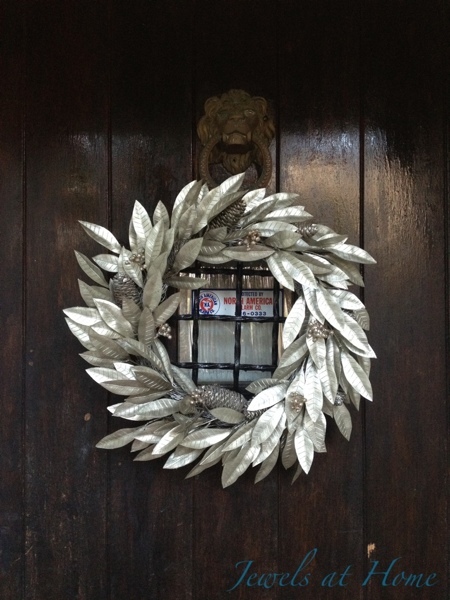 It sets the silvery tone right when you enter our house!